Seurat - TripImprover - Get More out of Your Museum Visits! Who is Toulouse-Lautrec? Georges-Pierre Seurat (1859-1891) was born and raised in Paris. He only became 31 years old and died in the midst of his career from an unknown disease. He was a Post-Impressionist painter. He can be classified even more accurately as a Neo-Impressionist painter. He received a classical art training at the traditional École des Beaux-Arts in Paris. While his painting style was far from traditional, his ideas benefited greatly from his education. He used a scientific approach to painting, whereby different colors can create different emotions and combining specific colors can create harmony in a painting. 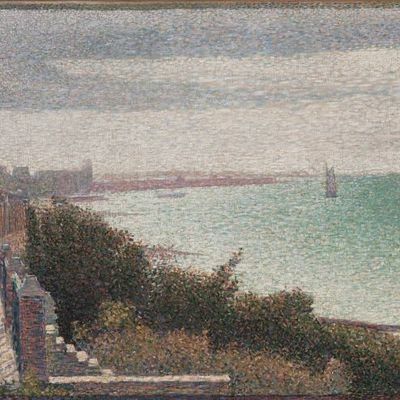 He decided not to combine colors in a painting, but instead to apply the colors separately, using small dots, and let the viewer combine the colors in his/her mind.